If you are an Admin for Endpoint Protection, you can create additional admins. You might want to add other admins so they can access Endpoint Protection reports and view data. When you create new users, Endpoint Protection sends them an email with further details for creating a password and logging in. Click the Endpoint Protection tab. The Endpoint Protection console displays. 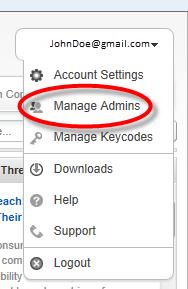 From the drop-down menu next to your login ID, select Manage Admins. Click the Create New Admins button. 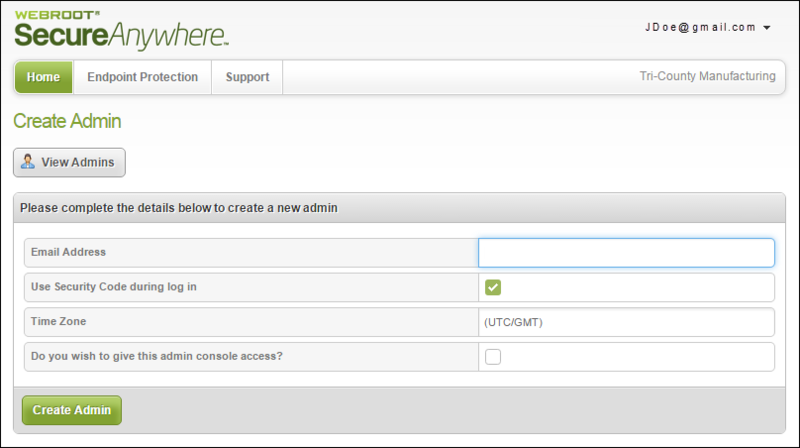 The Create Admin panel displays. In Email address field, enter the admin's email address. This is the address where the admin will receive the confirmation message. The email address will also serve as the admin's login name. If you entered the wrong email address and the user does not receive the message, you can change the email address and re-send it. For more information, see Editing Admin Settings. In the Use Security Code during log in area, select the checkbox to force the admin to enter a security code during log in. Otherwise, do not select the checkbox. In the Time Zone field, enter the country, region, or major city. The system displays a drop-down menu of choices. From that drop-down menu, select the appropriate time zone for the new admin. Select the Do you wish to give this user console access? checkbox. Basic - Gives limited access to consoles and account settings. 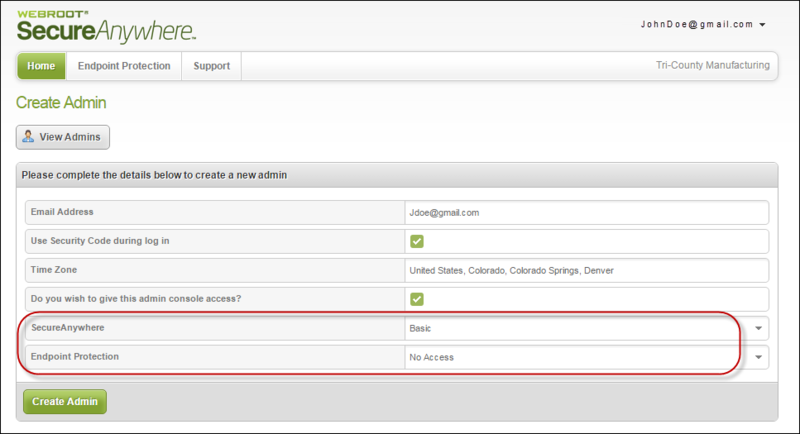 Admin - Gives full access to all keycodes, users, and account settings in Webroot portals. Basic - Gives read-only access to endpoint scans. Admin - Gives full access to all settings. 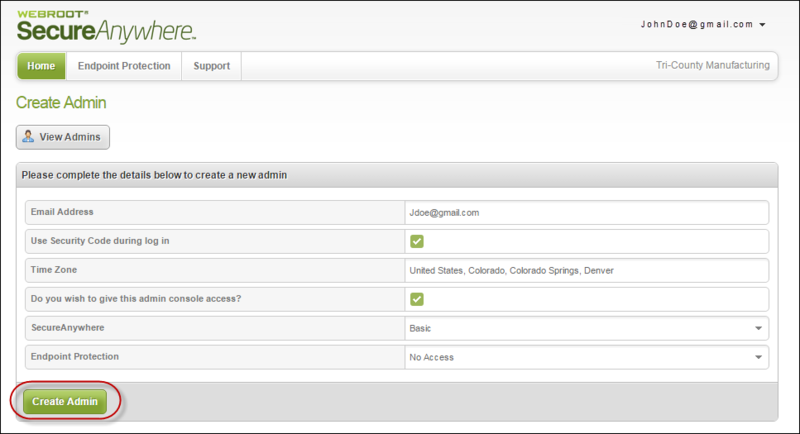 When you're done, click the Create Admin button to send a confirmation email to the new user. The user's email message includes a temporary password for the first login. When the user clicks the confirmation link in the email, the Confirm Registration panel displays for the admin to enter login information.